Join whale watching and adventure tour from Láki Tours. A hiking path around the base of the 463 metres high mountain takes around 3 hours. You'll see some spectacular views and varied bird life. The harbour is the district's lifeline. Excellent harbour facilities and favourable natural conditions have encouraged the growth of the fishing sector. The name of this golf course is derived from the ancient name of the Italian Bari. 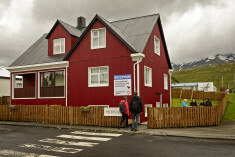 Grundarfjörður residents hold their annual summer festival, 'Good Times in Grundarfjörður', on the last weekend in July. 映画『Life!』（原題: Secret Life of Walter Mitty）のロケ地はグリーンランドやアフガニスタンなのですが、アイスランドの見事な景観を見に訪れてみてください !